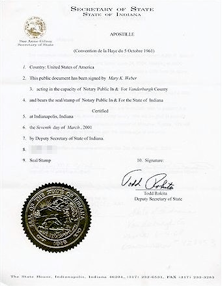 Apostille certificates are issued by a state government only for documents which have been signed by a government official or a Notary Public of that same state. 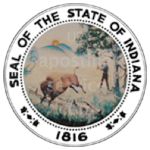 An original signature and seal/stamp of a Indiana State Notary Public or records custodian MUST be applied to the document to be apostilled. If the document is a vital records document (birth or death certificate) you must contact the State Department of Health and request a certified copy of that document. Then submit the document to the Secretary of State. County issued vital records cannot be apostilled. If the document is a court issued document (marriage license or divorce decree), you must obtain a certified copy from the Circuit Court clerk in the county in which the document was recorded. After obtaining such document, please forward it to the Secretary of State.